Nearly 50 years after the University of Texas tower shooting, controversy over the events of Aug. 1, 1966 lingers. 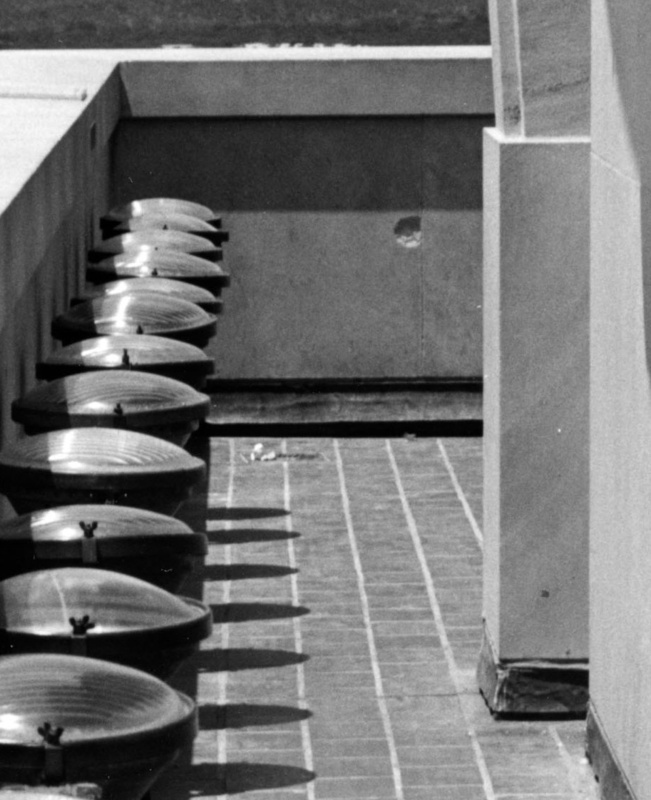 The dispute centers upon the two Austin police officers, Houston McCoy and Ramiro Martinez, who shot sniper Charles Whitman on the UT tower observation deck and stopped his killing spree. A faction maintains that McCoy was the only one to shoot and kill the sniper, and that he was denied the recognition he should have received until decades after it happened. To right that perceived wrong, they have created and pushed a revisionist history at the expense of Martinez and other heroes of the day. But are their claims based on facts? Here’s a glimpse at their claims and the evidence that refutes them. Argument: Claims the autopsy of Whitman’s body proves that McCoy’s shotgun pellets killed the sniper. Response: The autopsy report states that the sniper was killed by shotgun pellets to the brain and heart. After Martinez fired his service revolver and McCoy fired the shotgun, Martinez grabbed the shotgun and shot the sniper. Because both Martinez and McCoy fired the shotgun, it is impossible to say whether it was Martinez, McCoy, or both who fired the fatal shotgun pellets. Argument: Claims that Martinez, who emptied all six of his .38 revolver bullets at Whitman on the tower observation deck, missed his target and hit the wall. Response: The autopsy showed the sniper’s left arm was severely damaged by several large caliber bullet penetrations, which could not have been made by the shotgun. 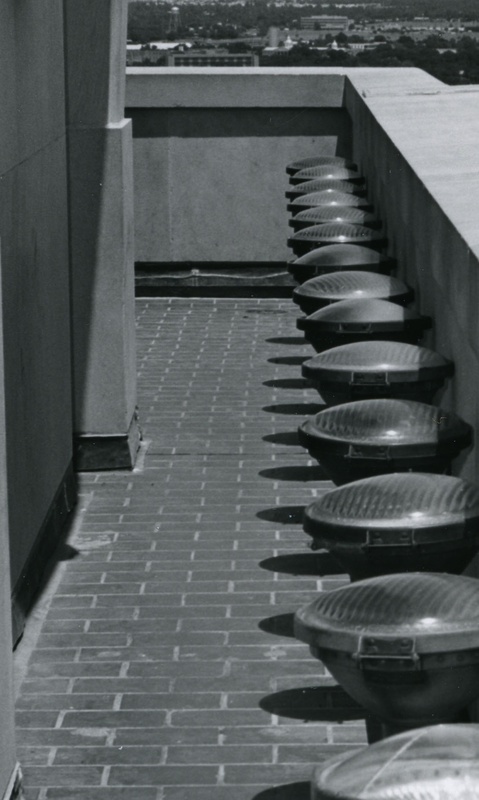 Further, Martinez and McCoy weren’t the only ones to fire a weapon on the observation deck. Deputized civilian Allen Crum fired a rifle, and his shot hit a wall, leaving a large hole. If any of Martinez’ .38 caliber bullets had hit the wall behind Whitman, they would have left holes as well. Argument: A grand jury met after the sniper incident to determine if killing the sniper was justifiable homicide. Those arguing that McCoy was solely responsible for stopping Whitman claim the fact that Martinez was not called to testify proves the district attorney recognized McCoy was the one to shoot the sniper to death. Response: The decision by the district attorney’s office not to call Martinez poses troubling questions. Other witnesses, including Crum, were summoned. Martinez was listed as the first witness on the APD homicide report for Whitman. 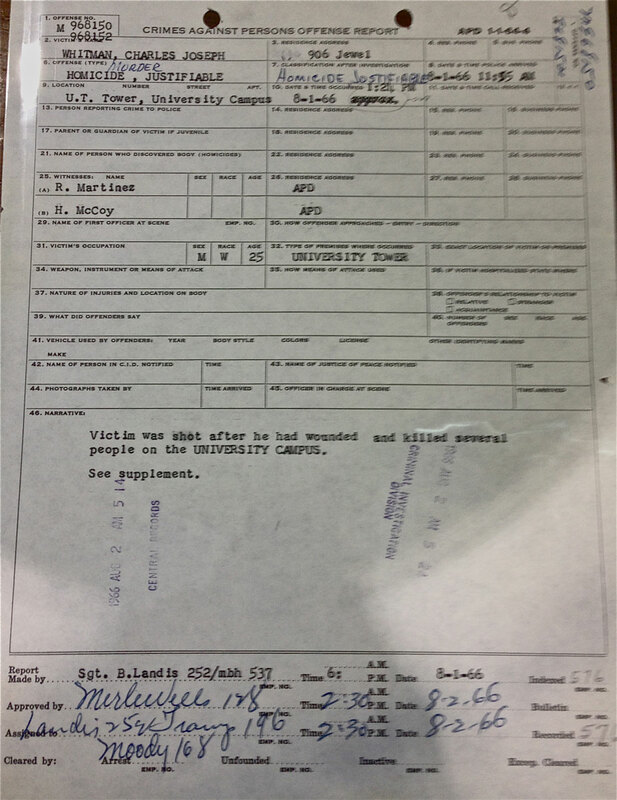 Martinez also led the charge to the UT tower observation deck and was the first law officer to make contact with the sniper. Why not summon him? The grand jury certainly was interested in hearing from Martinez, grand jury member Rudy Cisneros later told the press, but Austin Police Chief Bob Miles told the jury that Martinez was “in shock and very nervous” and could not appear. “The next day I asked his (Martinez’) brother-in-law, E.A. Galvan, how Martinez was feeling. He was Martinez was ‘cool as a cucumber,’” Cisneros said. If Miles was concerned about Martinez’ mental state, it didn’t stop him from having Martinez report to work at 6 a.m. on the morning following the sniper attack. Also unknown are the reasons former Miles sent Martinez to the burial of APD Officer Billy Speed in San Antonio on the same day as the grand jury hearing. Argument: Cites the fact that McCoy’s shotgun at Austin Police Department headquarters was tagged as the shotgun that Houston McCoy used to kill the UT Tower shooter. Response: The tag is a label. It is unknown who made it or what they used as evidence, but it is not definitive proof that McCoy was solely responsible for stopping Whitman any more than any other sign or label. Argument: In 1979 Miles said he regretted not doing more to ensure that McCoy was properly credited for killing the sniper. The former APD chief said the press made Martinez the hero of the story, and that’s the story that spread around the globe. 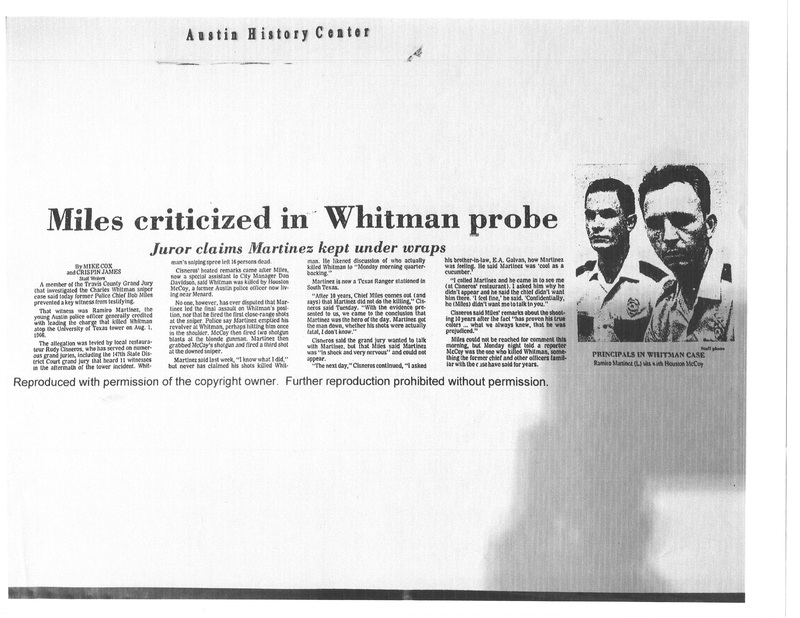 “Martinez was given all of the credit, which was unfortunate, but by the time it was discovered what had actually killed him (Whitman), the reports were already out,” Miles said. Response: Immediately after Martinez and McCoy shot the sniper, it was Miles who informed the press that an “attempted apprehension was made by Ramiro Martinez” and others. At the press conference, Miles told the press, “I’ll do the talking for the group.” After that, Miles had many opportunities to “correct the misinformation” — including in his 1966 end-of-year report to the Austin city manager. Why would Miles wait 13 years if he felt McCoy deserved proper credit? This is just a brief view of the controversy. More questions, answers, and the results of years of exhaustive research — are available by request: email inquiries@towershooting.com. NOTE: When the McCoy faction created this controversy, they made the focus of the UT tower shooting a discussion about fatal shotgun pellets. As a result, they shifted the focus away from where it rightfully belongs — on the victims of the shooting and those who unselfishly put their lives in danger to help others. This website was created with two goals in mind: to clarify misinformation related to the controversy — it is impossible to discuss the heroic actions of Crum, Martinez and McCoy without complete and accurate facts — and also, to pay homage to the victims and the heroes of the shooting.